Add exciting new details to the huge 22” long Eagle Transporter kit from MPC! Clear plastic sheet for crystal-clear views of the cockpit (enough is included to do the passenger pod windows as well). Replacement “scissors” for the passenger pod landing gear. 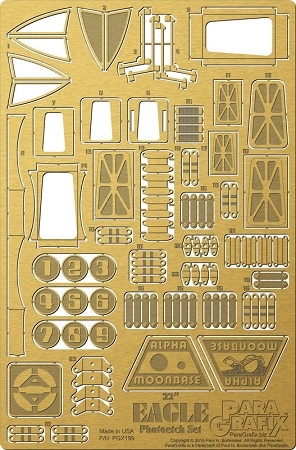 BONUSES: Moonbase Alpha logos as used in the first and second season, Eagle identification numbers, the “AA” Alpha door logo.